American Shaun White became the first snowboarder to win three Olympic titles when he sensationally snatched halfpipe gold, denying Japanese teenager Ayumu Hirano with a superb final run. Hirano, 19, landed back-to-back 1440s in his second run to overtake White with a score of 95.25, but the American replied with an amazing 97.75 to win. "I was so overwhelmed with happiness," a tearful White, 31, said. 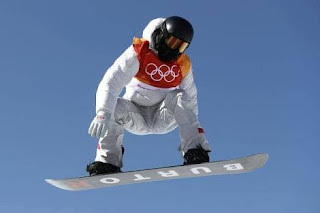 His victory secured a 100th Winter Olympic gold for the United States. "I've been through so much to get here," added White, whose country is behind only Norway (121) in terms of total Winter Olympic golds. "Waiting for my final score was awful and amazing at the same time. I knew I did a great ride and I was proud of that and I could walk away with my head high." It was the fourth snowboarding gold medal for the United States in Pyeongchang after successes for Chloe Kim, Red Gerard and Jamie Anderson.